I always think that peaches – like strawberries – need companions in their jam. I like to create a counterpoint to the cloying sweetness by adding other ingredients such as compatible fruit, herbs or spices. 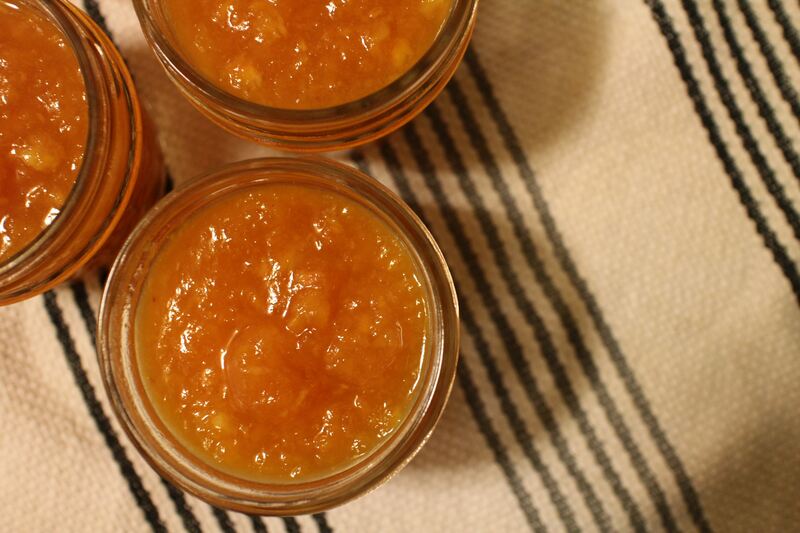 Fanny’s Peach Jam from Catherine Plagemann uses oranges to add texture and taste – a composite of marmalade and jam. Another season’s Peach Saffron Jam inspired by Paul Virant was savory, earthy, even musky. And Blackberry Peach Jam used peaches as a sparky addition to the deep rich flavor of the berries. Trimming my herb garden before it becomes sere and seedy in the dry fall weather, I clipped bunches of basil, including a particularly fine lemon basil plant. Lemon basil became a great complement to the ample lemon juice I added to keep the peaches from browning. I left the basil in the macerating fruit to infuse its grassy taste but removed it before cooking the jam. The lemon basil was subtle in the jam but noticeable. Peel the peaches by plunging them first into boiling water for a few seconds and then into ice water. The skins will slip off easily. Chop the peaches, dropping them into a large bowl in which you’ve placed the lemon juice. Add the sugar and salt and stir to combine, being careful not to bruise the fruit. Place the lemon seeds and a portion of the peel in a small muslin bag and immerse it in the fruit. Add the lemon basil, bruising the leaves somewhat to release their oil. Cover with crumpled parchment paper and macerate in the refrigerator for several hours or overnight. Prepare the kettle, jars and lids for water bath canning. Place a small saucer in the freezer. 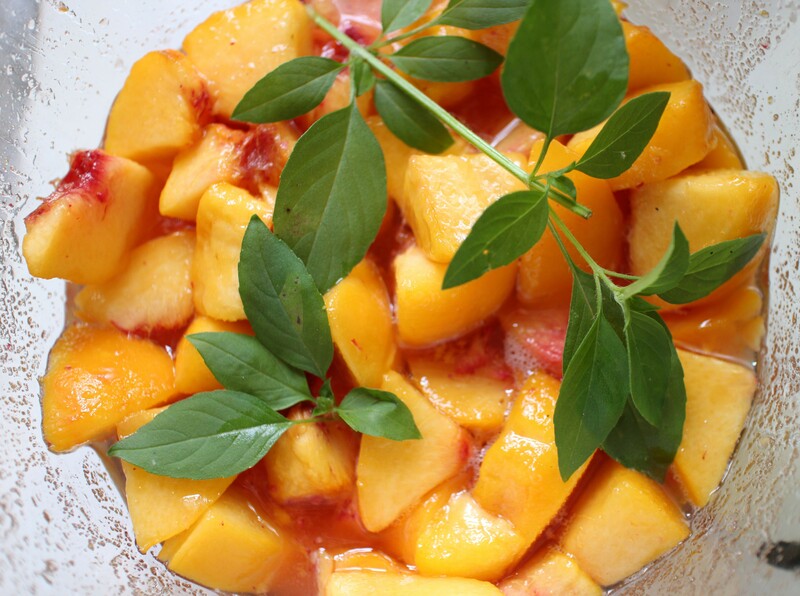 Bring the peach mixture to a boil, reduce the heat until medium, and cook until thick and gelled, under 10 minutes. (Test for gel by placing a drop of jam on the frozen saucer. If it wrinkles to the touch, the gel is good.) Spoon the jam into the prepared jars. Process the jars for 10 minutes after the water returns to a boil. Turn off the heat, remove the lid and let sit for 5 minutes before moving the jars to a counter to sit undisturbed until cool. Makes approximately 5 four-ounce jars.